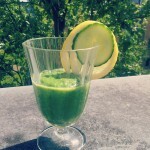 Todays Detox Smoothie is a real vitamin power bomb! It’s full of Vitamin A, vitamin C, antioxidants, beta-carotene and more! Carrots are good for your eyes and ginger supports weight loss. And the whole smoothie has very little calories. 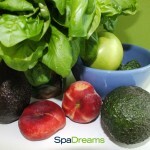 The orange Fresh Dream Detox Smoothie looks like summer and makes you feel unbelievable healthy. 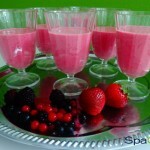 Our colleagues from SpaDreams Poland mixed this Power Smoothie for us today. 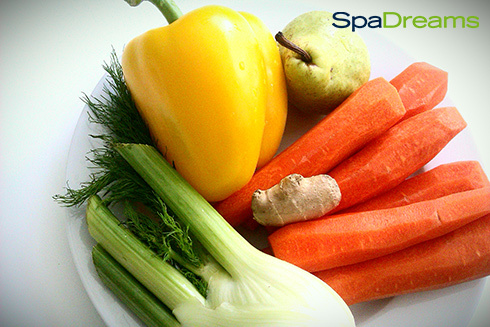 Peel the carrots and slice the yellow bell pepper, the fennel and the carrots and put them into the juicer. 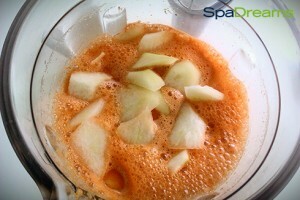 Then fill the juice into the blender and add the sliced pear and the grated ginger. 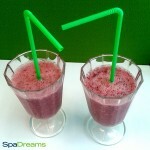 Now mix it till it’s smooth and enjoy your Vitamin Detox Smoothie! 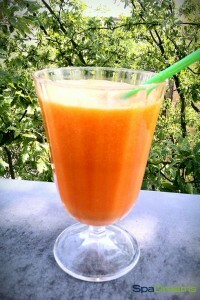 Looks like vitamin power and tastes delicious with spicy ginger and carrots! 4.80 out of 5 points, based on 5 votes.